Few articles added to the draft. Religions viewed not as the "opium" but the "plague" of peoples. Spasmodic control at all levels of political power of official religions. Massive fines for members of unofficial communities. Seizure and closure of "illegal sites" by the State. Expulsions from schools for "proselytism" activities. Rome (AsiaNews) - The new regulations on religious activities are aimed at annihilating underground communities and stifling official communities, making it impossible for any outward mission. This is evidenced by the recently published text on the site of the State Administration for Religious Affairs (SARA). They should come into force on 1 February 2018. A draft of the new regulations had been published last September. The new text does not change much from the draft, but - if possible - it is even worse. The few articles added (we counted three) worsen the list of alleged threats and deviations that may come from religions. In Chapter VIII on "Legal Responsibility", Article 63 has been added, which states: " Advocating,supporting, or funding religious extremism,or using religion to to harm national security or public safety, undermine ethnic unity, divide the nation,or conduct terrorist activities and separatism or terrorist activities, infringing upon citizens’ rights in their persons and democratic rights, impeding the administration of public order, or encroaching upon public or private property... ". The article also provides punishments for "criminal responsibility in accordance with law ", "administrative penalties in accordance with law ", "compensation" for losses to citizens "in accordance with law ". In China, you can count the number of attacks of a "religious" matrix on the fingers of one hand and are often subject to several sects with a few thousand adherents, compared to over 500 million believers of different religions. Yet the article - whose list of bad actions is repeated here and there in the text, for example, among the "prohibitions" - gives the impression that religions tout court are not only "the opium of the masses," as Marx said , but the plague of the peoples. The text reiterates that only a top-down control of religious affairs at all levels - national, provincial, county, city or village – renders a religion livable and acceptable. Representatives of religious offices at all levels are urged to "work", "organize", "test", "control" the work of the community of the faithful (see Articles 6, 26, 27) . This emphasis goes hand in hand with the testimonies that we receive from China: cameras placed at all religious sites; police checks in celebrations; dog-units for anti-drug checks! It should be noted that such checks are carried out even for official communities recognized by the state that behave according to the ministry's instructions. Under the new regulations, the underground communities should not even exist. As a result any activity that takes place in unregistered places and with unregistered staff results in massive fines: between 100 and 300 thousand yuan for "unauthorized" activities (Article 64); 50,000 yuan per activity in an "unauthorized" site; 50,000 yuan for providing an "unauthorized" site (Article 69); between 20,000 and 200,000 yuan for "unauthorized" travel abroad, even if it is for religious education or pilgrimage (hajj) (Article 70); up to 10,000 yuan for individuals involved in "illegal" religious activities (Article 74). These fines are very high, if you consider that the minimum wage in a city like Shanghai is 2300 yuan. In addition to the fines, the closure of the sites that hosted "illegal" activities and their sequestration and forfeiture to state assets are also included. Even before the regulations become the norm, for several months now police and representatives of the Religious Affairs Bureau have been meeting priests and lay faithful from underground communities for "a cup of tea" and "advising" them to register in the community official. In particular, priests are faced with a difficult choice: registration at the Religious Affairs Bureau automatically implies membership of the Patriotic Association, which, through its aim to build an "independent" Church, is "inconsistent" with Catholic Doctrine (Benedict XVI ). Another article added to the definitive text of the regulations is 70b. It states: "Where there is proselytization, organizing of religious activities, establishment of religious organizations, or establishment of religious activity sites in schools or educational institutions other than religious schools; the organ of review and approval or other relevant departments are to order corrections to be made within a certain time and give warnings; where there are unlawful gains, they are to be confiscated; where there circumstances are serious, order that enrollment is to be stopped and cancel education permits.... "
It concerns religious activities in state schools, whose measures have already been enforced before the promulgation of the regulations: students were expelled from schools because they were found praying privately in university buildings. 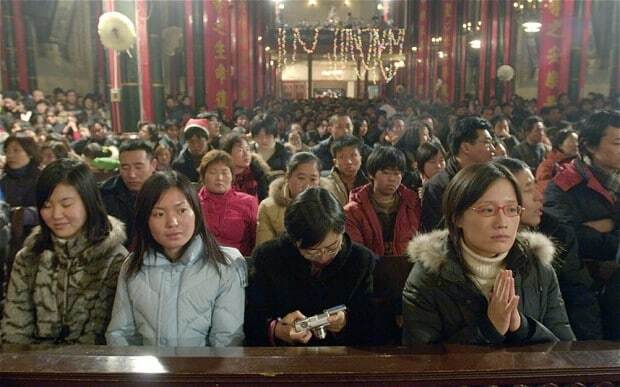 According to research by the University of Shanghai, at least 60% of students are interested in knowing about Christianity and there is a growth in the number of young catechumens in official and underground communities. The fact that the new regulations have added a new article aimed at punishing "proselytism" in schools is a sign of the vastness of the phenomenon. But all this is perhaps a symbol that applies to all of the articles of the regulations: it proclaims control, but China's religious awakening is now beyond control.